The Bermuda Dance Academy, directed by Nikia Manders, is getting set to present its third annual dance recital titled “Starstruck” on Saturday, June 9 at 2.00pm and 7.00pm at The Berkeley Institute’s Cafetorium. 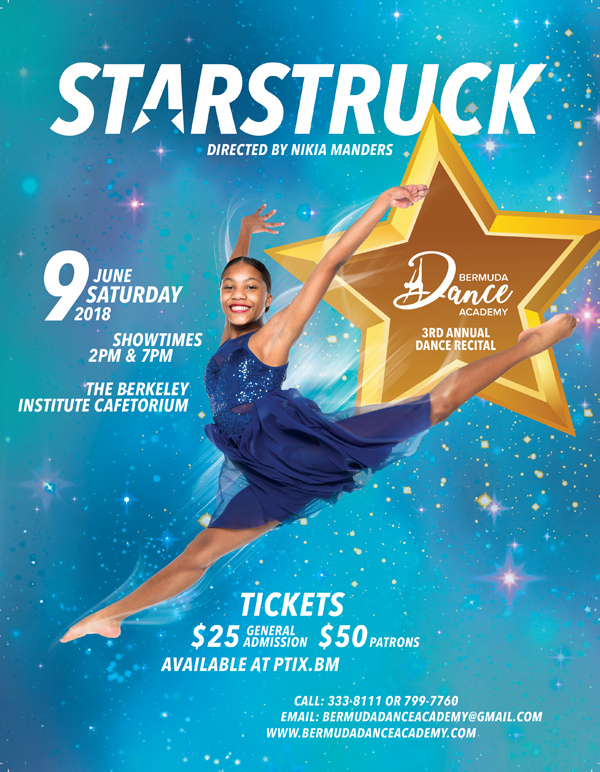 A spokesperson said, “Bermuda Dance Academy, directed by Nikia Manders, is excited to present its third annual dance recital “Starstruck” on Saturday, June 9th at 2.00pm and 7.00pm in The Berkeley Institute’s Cafetorium. “The dance recital will feature various styles of dance. Dancers from ages three to twenty-five will perform choreography to your favorite hit Musical Stars – Michael Jackson, Beyoncé, Celine Dion, James Brown and many others. “Our young dancers are very excited and have worked tirelessly practicing routines over the last few months in anticipation of this production. We are thankful to our parents for their continued support and commitment to our school”. “You won’t want to miss this exciting show that highlights both class and solo acts from a talented group of aspiring young dancers. “Those interested in partaking in a concert filled with your Billboard favorite Artists are encouraged to purchase tickets from the Bermuda Dance Academy studio or online at ptix.bm. General admission is $25 while patrons’ tickets are available for $50. “We are thankful to our dancers, teachers, parents, family and friends for their support and commitment throughout this event. It is their hard work and dedication that makes our work worthwhile.